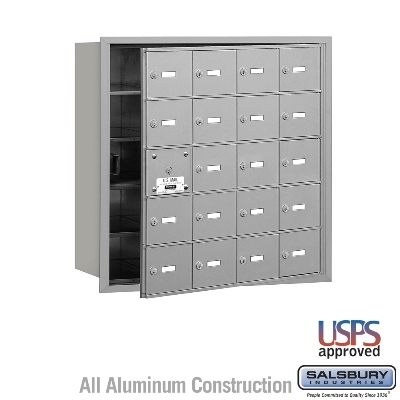 With its high-security design and quality construction, Salsbury’s 3700 series USPS approved 4C horizontal mailboxes will provide years of maintenance free service. 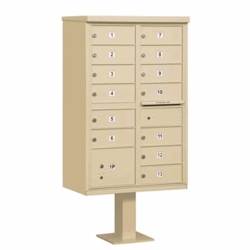 These units meet all the requirements of USPS-STD-4C, the new high-security standard developed by the United States Postal Service. 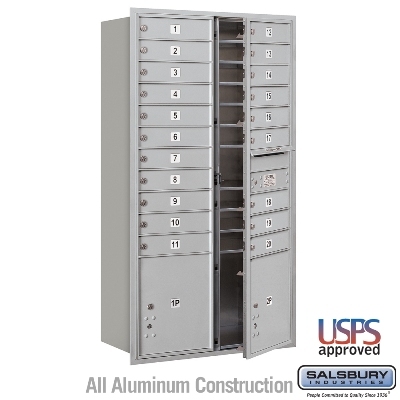 This document provides guidance to architects, designers, & contractors in selecting and installing Salsbury 3700 series mailbox units to provide service in compliance with ADA guidelines for wheelchair reach limitations. 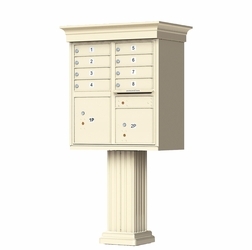 The vertical location of the mailbox units “above the finished floor” (AFF) controls the quantity of tenant compartments that comply with the reach requirements. 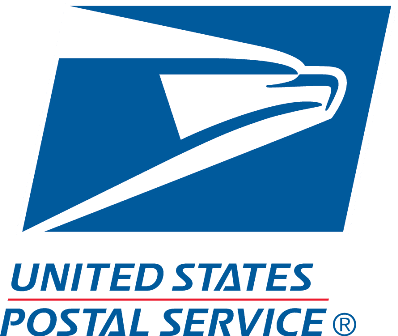 Forward reach from a wheelchair is covered in Section 308.2.1 of the 2010 ADA Standards for Accessible Design published by the U.S. Department of Justice (September 15, 2010). 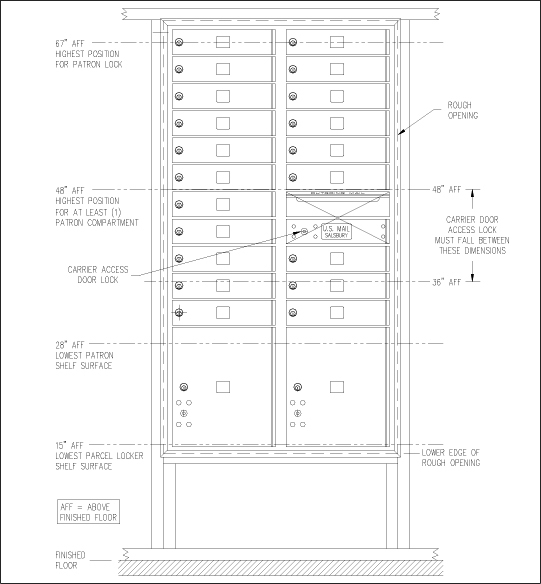 It states: “Where a forward reach is unobstructed, the high forward reach shall be 48 inches (1220 mm) maximum and the low forward reach shall be 15 inches (380 mm) minimum above the finish floor or ground.” See Figure 1. 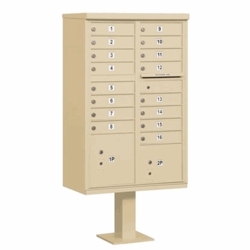 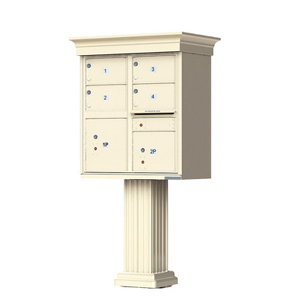 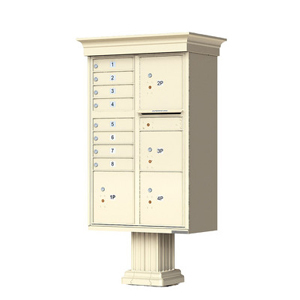 The 48” maximum high forward reach is also found in the USPS requirements where at least one tenant mailbox must be located less than 48” above the finished floor. 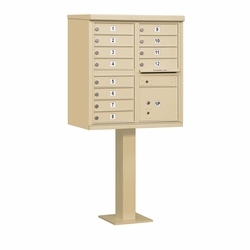 The 15” lower limit is also found in the USPS requirements as the lowest position above the finished floor for the shelf surface of a parcel locker. 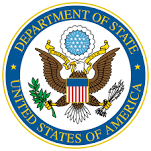 Side reach from a wheelchair is covered in Section 308.3.1 of the same document. 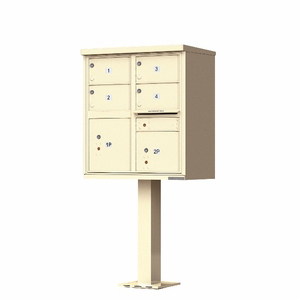 It states: “Where a clear floor or ground space allows a parallel approach to an element and the side reach is unobstructed, the high side reach shall be 48 inches (1220 mm) maximum and the low side reach shall be 15 inches (380 mm) minimum above the finish floor or ground.” See Figure 2. 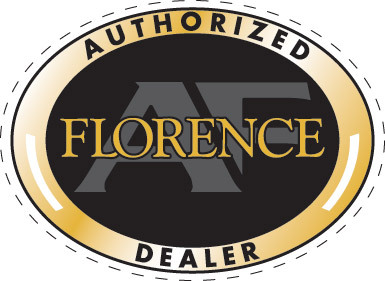 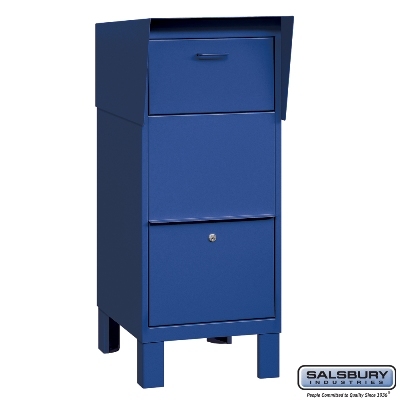 All 6 Door High, 5 Door High, 4 Door High and 3 Door High Salsbury standard configurations are ADA Compliant, with all mailbox units following within ADA guidelines. In addition, the remainder of Salsbury mailbox configurations have tenant compartments that are compliant with those limits. 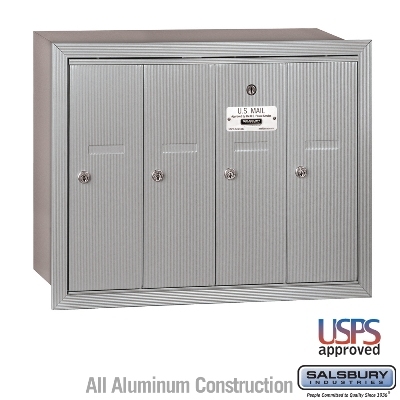 The mailboxes must be installed according to USPS-STD-4C regulations as listed below and shown in Figure 3.